Larry and Selma spent their married life farming local land and raising livestock. Eventually their partnership developed into a woodworking business, “The Kindling Box”, that expanded beyond Larry’s “tinkering” in the woodshop. Together they crafted and sold products at local craft shows throughout Illinois including nearly 30 years as a vendor at “Christmas on Vinegar Hill”. He loved his woodshop and the possibilities that existed in every piece of wood he cut and the conversations and friendships that emerged when someone asked him about his work. In more recent years, Larry’s carvings became a mainstay of their business. His creations ranged from the serious to the quirky but always started with an “ol’ block of wood.” Larry would often say, “I’m just an old woodcarver,” but that aspect of his life brought him great joy. His creativity, humor, and love of history lives on in the homes of customers who bought his works over the years. 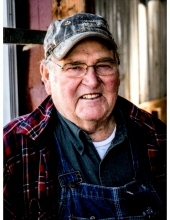 In addition to his wife and children, he is survived by his grandchildren Katie (Carl) Florczyk of Breese, Illinois; Sally (Alex) Norton of Daphne, Alabama; Thomas (Emily) Maske of Granger, Indiana, Kelsey (fiance, Noah Lindsay) Wilham of Morton, Illinois, and Kourtney Wilham of Mt. Pulaski, He also leaves behind 7 sweet great-granddaughters: Anna and Elyse Florczyk, Julia and Reese Norton, and Eva, Ella, and Molly Maske. Also surviving are his sisters-in law, Janice Torbeck, Carolyn Sigrist, Juanita Sigrist, and Pearl Sigrist, and his many nieces, nephews, and cousins. "Email Address" would like to share the life celebration of Lawrence Russell "Larry" Wilham. Click on the "link" to go to share a favorite memory or leave a condolence message for the family.